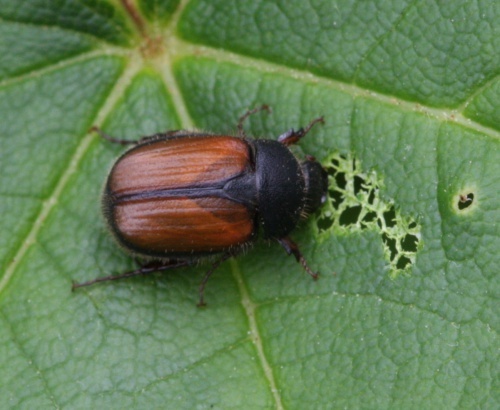 A small (5 mm to 7.5 mm) and rather hairy beetle, the head, pronotum and scutellum are black, and the elytra reddish-brown with black border. Associated with dry calcareous grassland. Usually encountered in summer when it will fly both by day and night. The larvae feed on roots. British records of this species come mainly from the south east of England. It is scarce nationally (Notable B). Rare in Leicestershire and Rutland. The specimen from Bloody Oaks Quarry on 2nd Jul 2015 is possibly the first record of this species in VC55.